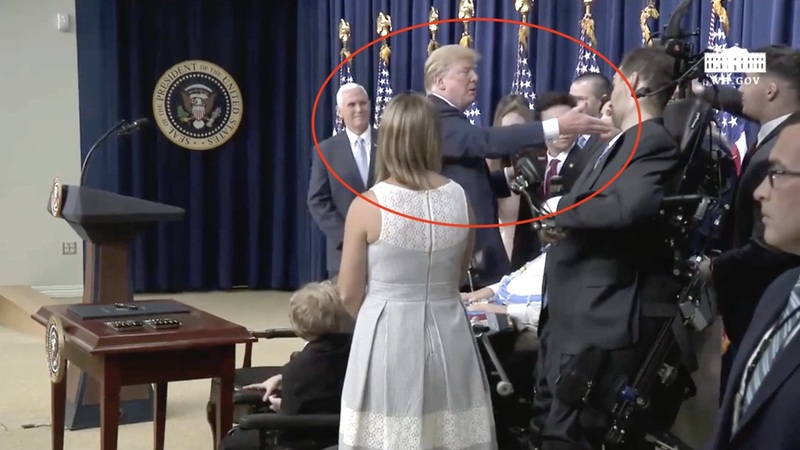 Trump signed the “Right to Try” bill today at the White House, joined onstage by Vice President Mike Pence and patients with debilitating diseases who will benefit from the legislation. “Right to Try” loosens regulations on experimental drugs and treatments for individuals suffering from terminal diseases. In some cases, the legislation will bypass the laborious FDA testing process to expedite treatment for the suffering individuals. Upon entering the room, Trump spoke with each individual onstage before making his remarks. As the president was leaning in to speak with a man in a wheelchair, a hot mic picked up Trump’s words. After exchanging pleasantries with the group onstage, Trump was overhead saying, “We’re going to do this first. This is more important. A speech is just words. This is more important,” as he continued to go one by one shaking hands of the individuals.